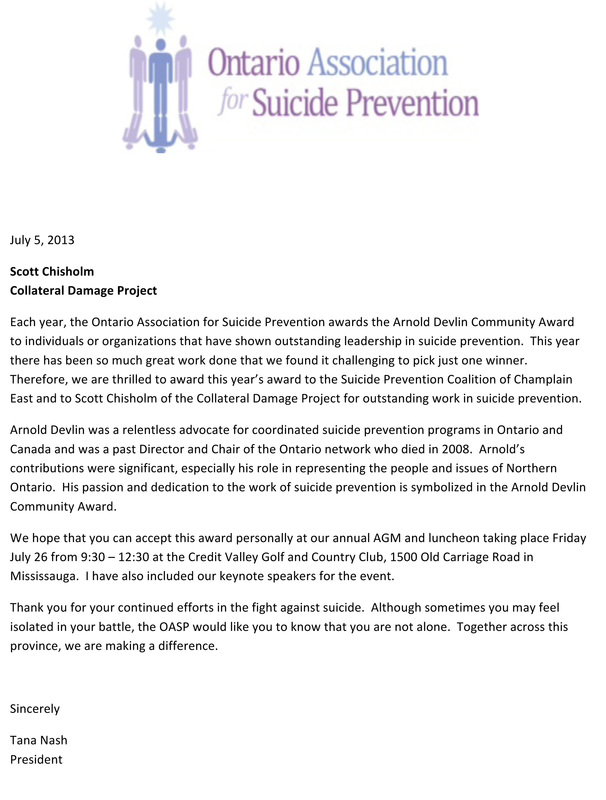 I am proud, honoured and humbled to be chosen as one of the two recipients of the Arnold Devlin Community Award by the Ontario Association for Suicide Prevention for 2013. As I was doing research on Arnold Devlin, I learned that he was a true leader, visionary and change maker. He is described by colleagues as a “Champion, Advocate, and Leader.” Arnold fought for what was right but most of all he cared, he cared about people. Words of Arnold Devlin (December 2007). Arnold Devlin was a passionate cyclist who is remembered fondly by many members of the Thunder Bay Cycling Club. This weekend, I will dedicate my long ride to Arnold Devlin and with great pride, I will somehow try to accept that my work is being acknowledged along the path that he created. I thank the Ontario Association for Suicide Prevention for recognizing my work through the Collateral Damage Project with the Arnold Devlin Community Award. Well deserved indeed!! Your work over these past years Scott, have been immense. Bravo!!! Congratulations Scott, I’m thrilled that you have been honoured with this award . Well deserved .